Roughly half of airline loyalty program members do not understand how to earn or redeem their points/miles, according to the J.D. Power 2018 Airline Loyalty Program Satisfaction Study.℠ Despite this high incidence of confusion, understanding how to redeem and earn rewards are among the most powerful drivers of customer satisfaction with airline loyalty programs. Confusing program details negatively affect satisfaction: Airline loyalty program member satisfaction climbs 123 points (on a 1,000-point scale) when members understand how to redeem points and 131 points when they understand how to earn points. Yet, half of general loyalty program members say they do not completely understand how their program works and, among status members, 30% say they do not completely understand their program. General member satisfaction improving faster than status member satisfaction: Both general and status membership satisfaction levels have improved year over year, but general member satisfaction is improving faster, driven by improvements in the earning and redeeming rewards and program benefits factors. Say my name: Overall satisfaction scores increase 120 points among status members and 78 points among general members when their name is used by airline staff or when their preferences are recognized. Increased mobile app use associated with higher satisfaction: Nearly half (46%) of loyalty program members say they have the programâ€™s mobile app on their phone or tablet, but less than half of those say they use it. Among members who have the app, satisfaction is significantly higher when they use the app frequently. A nation of points hoarders: Nearly three-fourths (74%) of airline loyalty program members prefer to save their points/miles to redeem larger rewards, while 13% prefer to redeem their points for quick discounts. 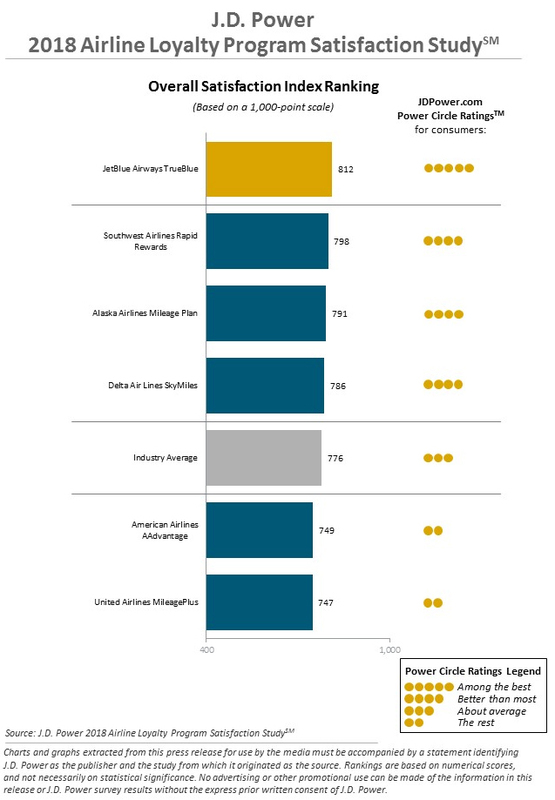 The 2018 Airline Loyalty Program Satisfaction Study measures member satisfaction with airline rewards and loyalty programs based on four factors (in order of importance): earning and redeeming rewards; program benefits; account management; and member communication. Results are based on 3,025 responses from rewards program members and was fielded in May-June 2018. JetBlue Airways TrueBlue ranks highest in overall member satisfaction with a score of 812, performing well in earning and redeeming rewards; program benefits; and member communication. Southwest Airlines Rapid Rewards (798) ranks second and Alaska Airlines Mileage Plan (791) ranks third. Copyright 2018 J.D. Power. All rights reserved. From http://jdpower.com.